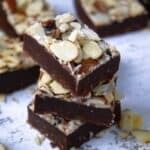 A guilt-free, decadent chocolate fudge that no one will ever guess is good for you. No-bake, vegan, and gluten free! Prepare a sandwich-sized tupperware container (or something similarly sized) with parchment paper. Set aside. In a food processor, combine dates and almond butter until mostly smooth. Add coconut oil, cacao powder and vanilla and pulse until well combined and smooth. Press mixture into prepared container and top with salt, coconut and sliced almonds. Place in freezer for at least 1 hour until firm. Let sit at room temperate for 5 minutes before cutting into 16 pieces. Store in airtight container in the freezer for up to 2 weeks. Enjoy!